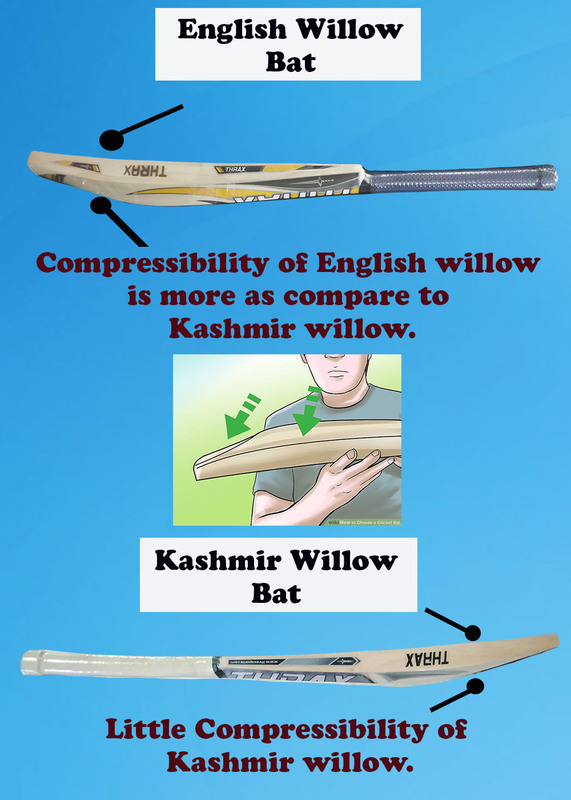 How To Differentiate Between Kashmir Willow And English Willow | Khelmart.org | It's all about Sports. English willow is found in UK and it is a special type of willow which is used to manufacture the English Willow Cricket Bats. Kashmir willow is found in J & K state of India. 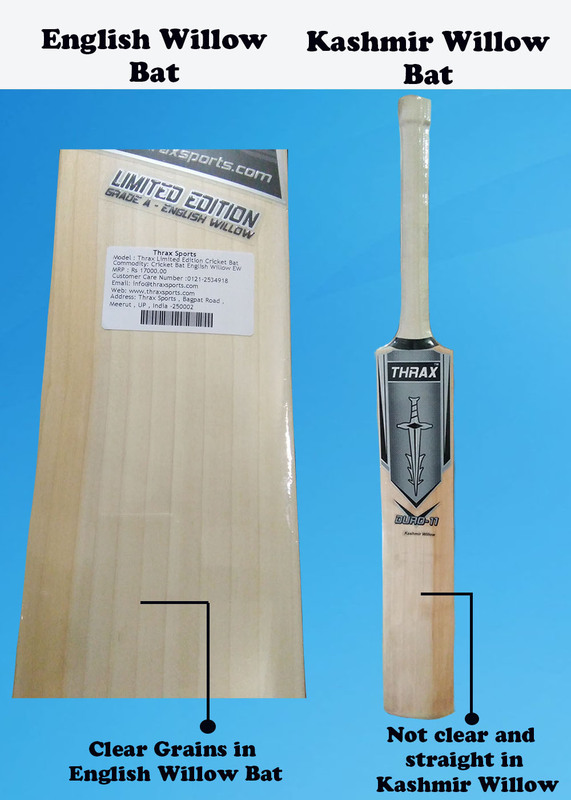 English Willow bats are considered superior quality as it offers best performance. Normally English Willow offers 4 to 11 grains based on grade of willow. Grains are very straight and clear in willow and looks like embossed profile of grains. Cricket Bat made by Kashmir willow offers fewer grains and sometimes it comes without any grains. Willow Grains in Kashmir Willow is not regular and very not clearly visible. Compressibility of English willow is more as compare to Kashmir willow. Better Compressibility results into better compression of bat and manufacture can provide better shape to bat. Better compressibility also gives better ping of bat. Cricket Bat produced with English Willow is very lightweight in nature. So if you want to take bat with 42 mm edge thickness with weight of around 1160 gms then it is only possible in English Willow Cleft. Kashmir willow is bit heavy in nature and normally bat produced with Kashmir willow will give you weigh around 1200 to 1280 gms. 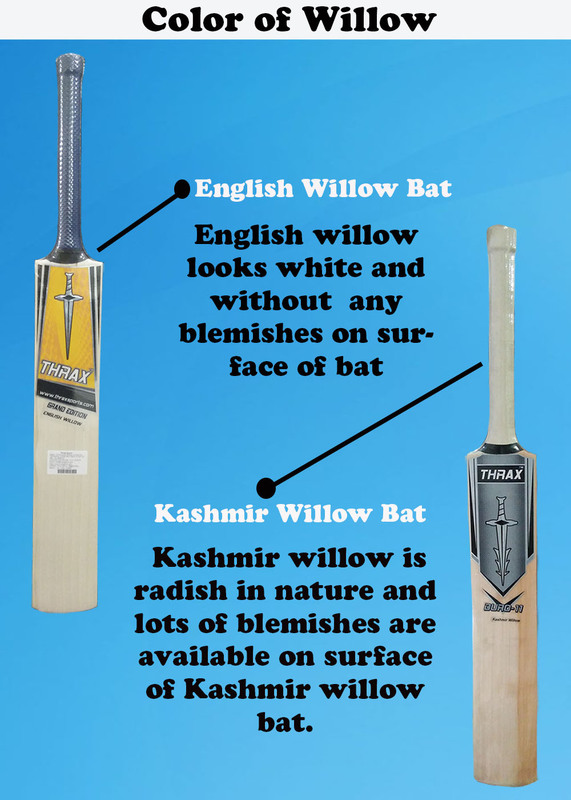 English willow looks white and without any blemishes on surface of bat while Kashmir willow is radish in nature and lots of blemishes are available on surface of Kashmir willow bat. The main difference in both the willow is its ping. 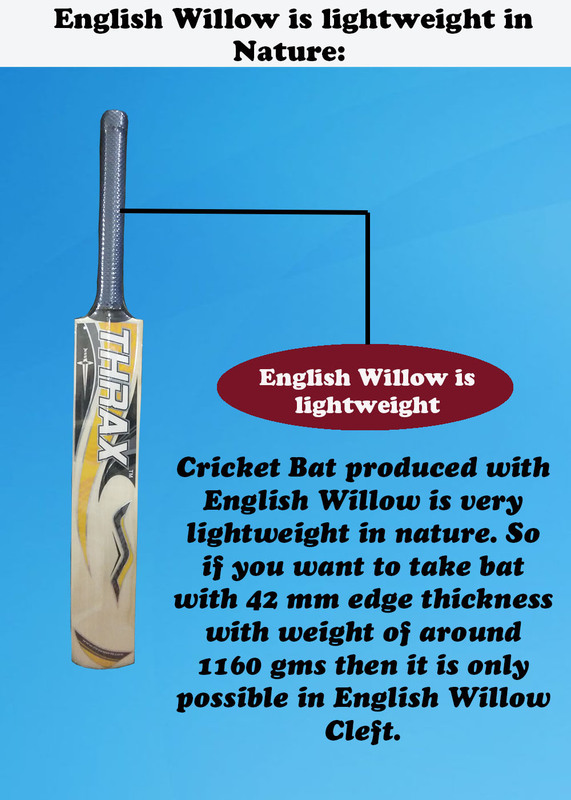 English Willow is soft in nature and due to its compressibility it offers best ping while on other hand Kashmir willow bat ping is good but if you compare it with English willow you will find huge difference. With above mentioned point , cricket player can easily differentiate in English and Kashmir willow bat. More details of Kashmir and English Willow Cricket Bat.